After the Second World War, soccer in Germany at the highest level was divided into five regional leagues, called Oberliga. One of the smallest being Oberliga South-West (Südwest), which was even divided into two groups, North and South. From this region in the occupied French zone emerged one the best German clubteams of all time, 1. FC Kaiserslautern. The brightest star of that team was of course Fritz Walter (31-10-1920), who already played 24 matches (19 goals) for the German national team from 1940 until 1942. After three years (1944-45 until 1946-47) without a German champion, 1947-48 would restart the tradition. The 1947-48 season in Oberliga South-West (Group North) was extraordinary. 1. FC Kaiserslautern won 23 of his 26 matches, only drawing twice (0-0 against Saarbrucken and 0-0 against Phönix Ludwigshafen) and just losing the one match, 2-0, against Vfl Neustadt. Defensively 1. FC Kaiserslautern only conceded 18 goals, with Werner Kohlmeyer, Werner Liebrich and his brother Ernst as main assets. However, in attack the team was even more superior. 1. FC Kaiserslautern scored an astonishing 151 goals in 26 matches, an average of nearly six goals every match. Günther Grewenig scored 16 goals, Werner Bassler 28 and Fritz Walter 31. But it was Fritz’s brother Ottmar (6-3-1924) who stood out in this year. Especially in the big wins he couldn’t stop scoring. Five against FSV Mainz 05 (13-2), SpVgg Andernach (11-2) and SG Gonsenheim (13-0), seven against SV Völklingen (13-1) and even eight in the second match against SpVgg Andernach (13-0). In all the other league matches he managed another 21 goals, making it 51 for the season. The first step towards the national championship had been taken. After that the team first defeated Fortuna Rastatt, winner of the South Group of Oberliga South-West. Away Kaiserlautern won 3-0, at home it ended 6-1. So now the real challenge began, trying to get into the German final. In the quarterfinal of the tournament they beat 1860 München 5-1 (goals from Bassler (2), Christmann (2) and Ottmar Walter) in Worms. After that they travelled to Wuppertal for the semi-final against TuS Neuendorf. Another easy win later, 5-1, with goals coming from Ottmar Walter (2), Bassler, Grewenig and Fritz Walter. 1. FC Kaiserslautern had reached the final. The final was on August 8, 1948, in the Müngerdorfer Stadium in Cologne. It was the first final for Kaiserslautern, opponent 1. FC Nürnberg was much more experienced. They had been German champions six times. With their star player Max Morlock they proved to be too strong. After a 2-0 lead, Kaiserslautern only managed to get one back, through an own goal by Nürnberg-defender Hans Ubelein. So Kaiserslautern didn’t succeed in their first attempt, but the club had a string of success in the forthcoming years. They won the Oberliga eight times in the next nine seasons, winning 206 of their 260 matches and scoring an amazing total of 1,095 goals. Two times (1951 and 1953) they were crowned German champion. 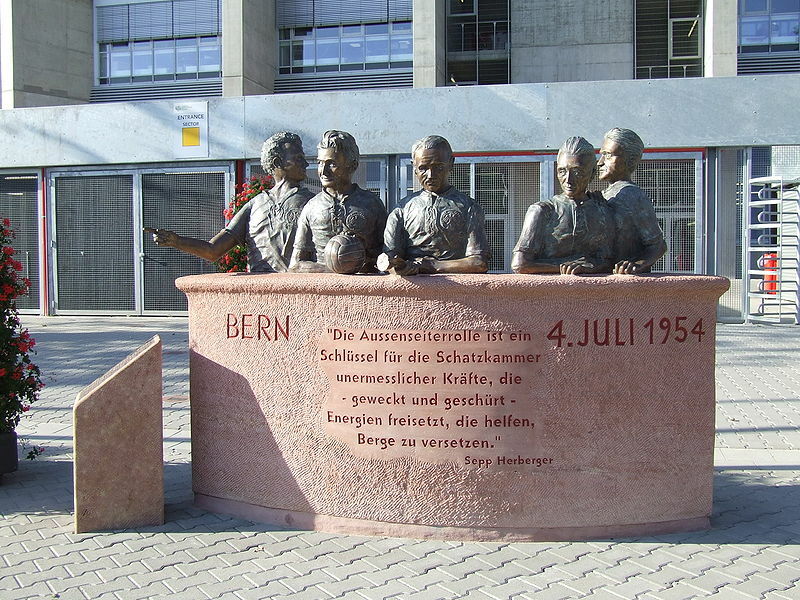 But the biggest moment of the club was embedded in the national team triumph in Bern, 1954, when Germany won the World Cup against the Mighty Magyars. Five of the gold medal winners (captain Fritz Walter, Ottmar Walter, Werner Kohlmeyer, Werner Liebrich and Horst Eckel) all played for 1. FC Kaiserslautern. Only young Horst Eckel didn’t compete in the season that started everything, 1947-48.